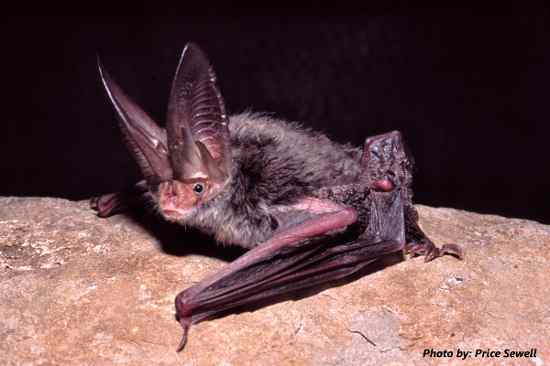 The Rafinesque’s Eastern Big-eared Bat is a medium sized bat, with the dorsal hair gray-brown with black bases, and the ventral hair whitish-yellowish with black bases. The fur is long and shaggy and it has huge ears up to twice the length of the head connected across the forehead. There is a glandular mass on either side of the muzzle, and elongated nostril openings. The total length (male smaller than female) is 80-110 mm, with a wingspread from 265-301 mm, and a weight of 7.9-13.6 grams. Mating is in the fall and winter, and single naked young are born in the nursery colony in May or June. This species roosts singly, in small clusters, or groups to 100 or more in hollow trees, under loose bark, houses, unoccupied buildings and culverts. It hibernates in the northern part of the range. The ears are coiled back like ram’s horns. They may need a variety of roosts to adjust for seasonal temperature and food fluctuations. This bat is a slower flier but more manueverable and can hover. Longevity is 8-10 years or more. This bat is designated endangered in Virginia. There was a Rafinesque’s Eastern Big-eared Bat specimen collected at Lake Drummond in Dismal Swamp in a cypress snag and there is a recent report of this species from Virginia Beach. The eastern big-eared bat is incidental in Virginia because it has adapted to temperate, arboreal zones found only in the extreme southeast. P.r. macrotis is most often found in houses, or sometimes in hollow trees, behind loose bark, in culverts, or in caves and mines. Not much is known about the food habits of the Rafinesque’s Eastern Big-eared Bat species but it’s primary sustenance are probably moths. For fast, safe and humane Virginia Bat Removal contact us at (804) 729-0046 or toll-free at (888) 824-7383. Call us for more questions on the Rafinesque’s Eastern Big-eared Bat in Virginia. We also trap, remove, capture, control, manage and exclude all Virginia Wildlife and Animal Pest Control.